I love caramel candies. I remembered when it was Halloween, I would pick out all the Kraft Caramel ones and eat them. Though I've always wondered what sort of crap they'd put in those things to make it so addictive. Back in the day, large companies would use chemicals (not real food) in our food to make it taste better or last longer, and we didn't care. 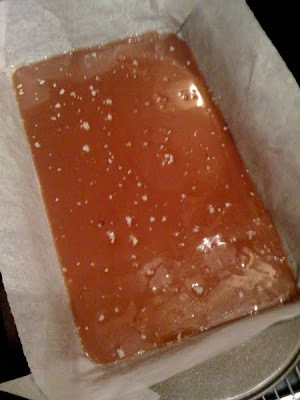 One day, I came across these caramel candies recipe on Not So Humble Pie and it looked so easy. 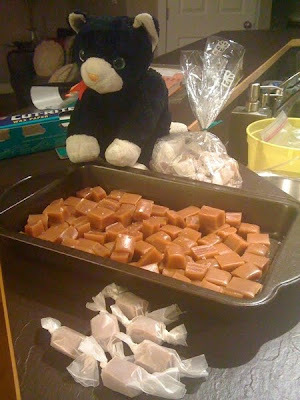 As opposed to watching Mr. Meow make toffee, which is pretty similar things, and it seemed like a mess. Made them over Christmas holidays and Meow friends were fighting over them! WTF? They're just candies, no? Mr. Meow wouldn't stop eating them. He'd eat at least 5 in one sitting if I didn't stare at him in disbelief. One thing to note about Humble's recipe is that she uses 40%+ whipping cream which I still have yet to find in stores in this city. Whipping cream usually range from 33-36% here. That will have a huge effect on which point you should boil it to. 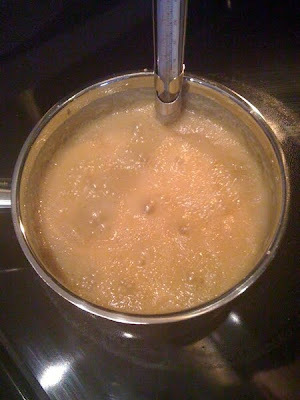 If you are using 33-36% whipping cream, boil it to 230-240F. Better to under boil than over boil, you'll know what I mean when you try to cut the candies. And I prefer to sprinkle in the salt right after I poured it into a pan to cool, that way, the salt gets "glued" into the caramel much better than rolling the cut pieces into it. With Fleur de Sel sprinkled in and cooling. OMG! I don't have Fleur de Sel! Use Sel Gris (Grey Salt). I know Fleur de Sel can be pricey for some people's budgets. OMG! I only have golden corn syrup in my cupboard! It doesn't make a damn difference, it's still corn syrup. Your candies will just come out a bit darker. OMG! I don't have a candy thermometer! You're doomed! Go get one, unless you like doing drop-water tests every 5 seconds.